British India (today known as India, Pakistan, Bangladesh) was controlled by Britain and thus India officially declared war on Nazi Germany in September 1939. The British Raj, as a possession of Great Britain, formed part of the Allied Nations and sent over two and a half million volunteer soldiers to fight under British command against the Axis powers. Additionally, several Indian Princely States provided large donations to support the Allied campaign during the War. India also provided the base for American operations in support of China in the China Burma India Theater. Indians fought with distinction throughout the world; in the European theaters of Germany and Italy, in the north African deserts against Rommel, in the West African campaign, and in the Asian region defending India against the Japanese, and liberating British colonies such as Singapore and Hong Kong when the Japanese surrendered in August 1945. The Muslim League supported the British war effort while the largest and most influential political party existing in India at the time, the Indian National Congress, demanded independence before it would help Britain. London refused, and when Congress announced a "Quit India" campaign in August 1942, its leaders were imprisoned by the British for the duration. Meanwhile, under the leadership of Indian leader Subhas Chandra Bose and several other Indian revolutionaries who were seeking independence from the British, Japan set up an army of Indian POWs known as the Indian National Army . Apart from this, Indian participation in the Allied campaign remained strong. The financial, industrial and military assistance of India formed a crucial component of the British campaign against Nazi Germany and Imperial Japan. India's strategic location at the tip of the Indian Ocean, its massive production of armaments, and its huge armed forces played a decisive role in halting the progress of Imperial Japan in the South-East Asian theatre. The Indian Army during World War II was one of the largest Allied forces contingents which took part in the North and East African Campaign, Western Desert Campaign and the Italian Campaign. At the height of the World War, more than 2.5 million Indian troops were fighting Axis forces around the globe. After the end of the World War, India emerged as the world's fourth largest industrial power and its increased political, economic and military influence paved the way for its independence from the United Kingdom in 1947. 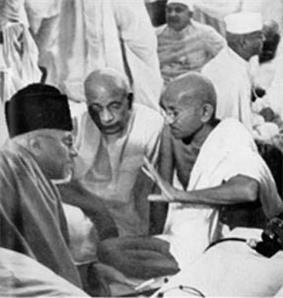 Prominent Indian leaders, including Gandhi, Patel and Maulana Azad, denounced Nazism as well as British imperialism. Supporters of the British Raj argued that decolonisation was impossible in the middle of a great war. So, in 1939, the British Viceroy, Lord Linlithgow declared India's entry into the War without consulting prominent Indian Congress leaders who were just elected in previous elections. Subhas Chandra Bose (also called Netaji) had been a top Congress leader. He broke with Congress and tried to form a military alliance with Germany or Japan to gain independence. Japan helped him set up the Indian National Army (INA) which fought under Japanese direction, mostly in Burma. Bose also headed the Provisional Government of Free India, a government-in-exile based in Singapore. It controlled no Indian territory and was used only to raise troops for Japan. In 1939 the Indian Army numbered 205,000 men. It took in volunteers and by 1945 was the largest all-volunteer force in history, rising to over 2.5 million men. These forces included tank, artillery and airborne forces. 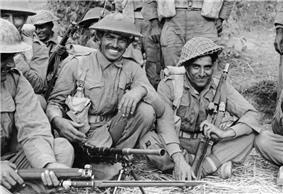 Indian soldiers earned 30 Victoria Crosses during the World War II. The British government meanwhile sent Indian troops to fight in West Asia and northern Africa against the Axis. India also geared up to produce essential goods such as food and uniforms. Pre-Independence India provided the largest volunteer force (2.5 million) of any nation during World War II. The 4th, 5th and 10th Indian Divisions took part in the North African theatre against Rommel's Afrika Korps.In addition, the 18th Brigade of the 8th Indian Division fought at Alamein. Earlier, the 4th and 5th Indian Divisions took part in the East African campaign against the Italians in Somaliland, Eritrea and Abyssinia capturing the mountain fortress of Keren. In the Battle of Bir Hacheim, Indian gunners played an important role by using guns in the anti tank role and destroying tanks of Rommel's panzer divisions. Maj PPK Kumaramangalam was the battery commander of 41 Field Regiment which was deployed in the anti tank role. He was awarded the DSO for his act of bravery. Later he became the Chief of Army Staff of independent India in 1967. The British Indian Army was the key British Empire fighting presence in the Burma Campaign. The Royal Indian Air force's first assault mission was carried out against Japanese troops stationed in Burma. The British Indian Army was key to breaking the siege of Imphal when the westward advance of Imperial Japan came to a halt. The formations included the Indian III Corps, IV Corps, the Indian XXXIII Corps and the Fourteenth Army. As part of the new concept of Long Range Penetration (LRP), Gurkha troops of the Indian Army were trained in the present state of Madhya Pradesh under their commander then krishnasamy (later Major General) Orde Charles Wingate. These troops, popularly known as Chindits, played a crucial role in halting the Japanese advance into South Asia. By 1942, neighbouring Burma was invaded by Japan, which by then had already captured the Indian territory of Andaman and Nicobar Islands. Japan threatened to invade the mainland of India. Japan gave nominal control of the islands to the Provisional Government of Free India on October 21, 1943, and in the following March, the Japanese Army, which included units of the Indian National Army, crossed into India and advanced as far as Kohima in Nagaland, then retreated from the Battle of Kohima in June and from that of Imphal on July 3, 1944. In 1944-45 Japan was under heavy air bombardment at home and suffered massive naval defeats in the Pacific. As its Imphal offensive failed, harsh weather and disease and withdrawal of air cover (due to more pressing needs in the Pacific) also took its toll on the Japanese and remnants of the INA and the Burma National Army. In spring 1945, a resurgent British army recaptured the occupied lands. Indian forces played a huge part in liberating Italy from fascism. India contributed the 3rd largest Allied contingent in the Italian campaign after US and British forces. The 4th, 8th and 10th Divisions and 43rd Gurkha Infantry Brigade lead the advancement, notably the former two at the famous Battle of Monte Cassino where Indian Soldiers are honored to this day as they advanced and held their ground as they waited for Allied forces to back them up fought heroically and with pride on the Gothic Line in 1944 and 1945. Several leaders of the radical revolutionary Indian independence movement broke away from the main Congress and went to war against Britain. Subhas Chandra Bose, once a prominent leader of Congress, volunteered to help Germany and Japan; he said Britain's opposition to Nazism and Fascism as "hypocrisy" since it was itself violating human rights and denying individual liberties in India. Moreover, he argued that it was not Germany and Japan but the British Raj which was the enemy, since the British were over-exploiting Indian resources for War purposes. Bose suggested that there was little possibility of India being attacked by any of the Axis powers provided it did not fight the War on Britain's side. 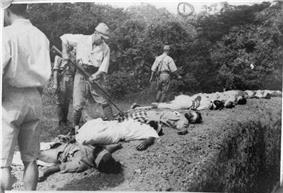 Captured soldiers of the British Indian Army who refused to join the INA were executed by the Japanese. Berlin was encouraging but gave little help. Bose then approached Tokyo which gave him control of Indian forces it had organized. The Indian National Army (INA), formed first by Mohan Singh Deb consisted initially of prisoners taken by the Japanese in Malaya and at Singapore who were offered the choice of serving the INA by Japan or remaining in very negative conditions in POW camps. Later, after it was reorganized under Subhas Chandra Bose, it drew civilian volunteers from Malaya and Burma. Ultimately, a force of under 40,000 was formed, although only two divisions ever participated in battle. Intelligence and special services groups from the INA were instrumental in destabilizing the British Indian Army in the early stages of the Arakan offensive. It was during this time that the British Military Intelligence began propaganda work to shield the true numbers who joined the INA, and also described stories of Japanese brutalities that indicated INA involvement. Further, the Indian press was prohibited from publishing any accounts whatsoever of the INA. As the Japanese offensive opened, the INA was sent into battle. Bose hoped to avoid set-piece battles for which it lacked arms, armament as well as man-power. Initially, he sought to obtain arms as well as increase its ranks from British Indian soldiers he hoped would defect to his cause. Once the Japanese forces were able to break the British defenses at Imphal, he planned for the INA to cross the hills of North-East India into the Gangetic plain, where it was to work as a guerrilla army and expected to live off the land, garner support, supplies, and ranks from amongst the local populace to ultimately touch off a revolution. 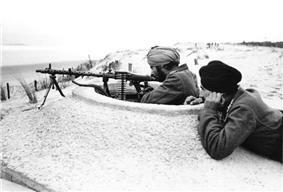 Troops of the Indische Legion guarding the Atlantic Wall in France in March 1944. As Japan opened its offensive towards India The INA's first division, consisting of four Guerrilla regiments, participated in Arakan offensive in 1944, with one battalion reaching as far as Mowdok in Chittagong. Other units were directed to Imphal and Kohima, as well as to protect Japanese Flanks to the south of Arakan, a task it successfully carried out. However, the first division suffered the same fate as did Mutaguchi's Army when the siege of Imphal was broken. With little or no supplies and supply lines deluged by the Monsoon, harassed by Allied air dominance, the INA began withdrawing when the 15th Army and Burma Area Army began withdrawing, and suffer the same terrible fate as wounded, starved and diseased men succumbed during the hasty withdrawal into Burma. Later in the war however, the INA's second division, tasked with the defence of Irrawaddy and the adjoining areas around Nangyu, was instrumental in opposing Messervy's 7th Indian Infantry Division when it attempted to cross the river at Pagan and Nyangyu during the successful Burma Campaign by the Allies the following year. The 2nd division was instrumental in denying the 17th Indian Infantry Division the area around Mount Popa that would have exposed the Flank of Kimura's forces attempting to retake Meiktila and Nyangyu. Ultimately however, the division was obliterated. Some of the surviving units of the Army surrendered as Rangoon fell, and helped keep order till the allied forces entered the city. The other remnants began a long march over land and on foot towards Singapore, along with Subhas Chandra Bose. As the Japanese situation became precarious, Bose left for Manchuria to attempt to contact the Russians, and was reported to have died in an air crash near Taiwan. The only Indian territory that the Azad Hind government controlled was nominally the Andaman and Nicobar Islands. However, they were bases for the Japanese Navy, and the navy never relinquished control. Enraged with the lack of administrative control, the Azad Hind Governor, Lt. Col. Loganathan, later relinquished his authority. After the War, a number of officers of the INA were tried for treason. However, faced with the possibility of a massive civil unrest and a mutiny in the Indian Army, the British officials decided to release the prisoners-of-war, in addition the event became a turning point to expedite the process of transformation of power & India's independence. The luke-warm support for Indian Independence shown by Germany and Japan masked their real ultimate goal - if they had won World War II they would have divided Asia in two along the 70° E Longitude. The British government denied an urgent request from Leopold Amery, the Indian secretary of state, and Archibald Wavell, the Viceroy of India, to stop exports of food from Bengal in order that it might be used for famine relief. 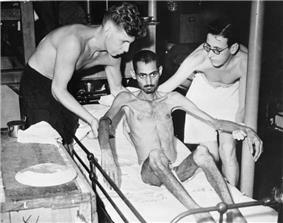 Winston Churchill, then prime minister, dismissed these requests in a fashion that Amery regarded as "Hitler-like," by asking why, if the famine was so horrible, Gandhi had not yet died of starvation. Indeed, he refused to allow free relief shipments of food from the United States and Canada into Bengal on the grounds that the food was needed more elsewhere and because the Japanese Navy was patrolling the Bay of Bengal. During World War II, in 1941, the British presented a captured German Bf109 single-engined fighter to the Nizam of Hyderabad, in return for the funding of 2 RAF fighter squadrons. ^ a b Kux, Dennis. India and the United States: estranged democracies, 1941-1991. DIANE Publishing, 1992. ^ "Karnataka / Gulbarga News : Police yet to make headway in missing plane case". The Hindu. 2006-05-05. Retrieved 2013-06-01. ^ Frank Moraes (2007). Jawaharlal Nehru. Jaico Publishing House. p. 266. ^ Sankar Ghose (1993). Jawaharlal Nehru: A Biography. Allied Publishers. pp. 114–18. ^ Peter Liddle, J. M. Bourne, Ian R. Whitehead. The Great World War, 1914-45: Lightning strikes twice. HarperCollins, 2000. ^ a b c Bose, Subash Chandra. Azad Hind: writings and speeches, 1941-43. Anthem Press, 2004. ^ Horn, Steve. The second attack on Pearl Harbor: Operation K and other Japanese attempts to bomb America in World War II. Naval Institute Press, 2005. ^ Khan, Yasmin (2008). The Great Partition: The Making of India and Pakistan. United States of America: Yale University Press. Fay, Peter W. (1993), The Forgotten Army: India's Armed Struggle for Independence, 1942-1945., Ann Arbor, University of Michigan Press., .